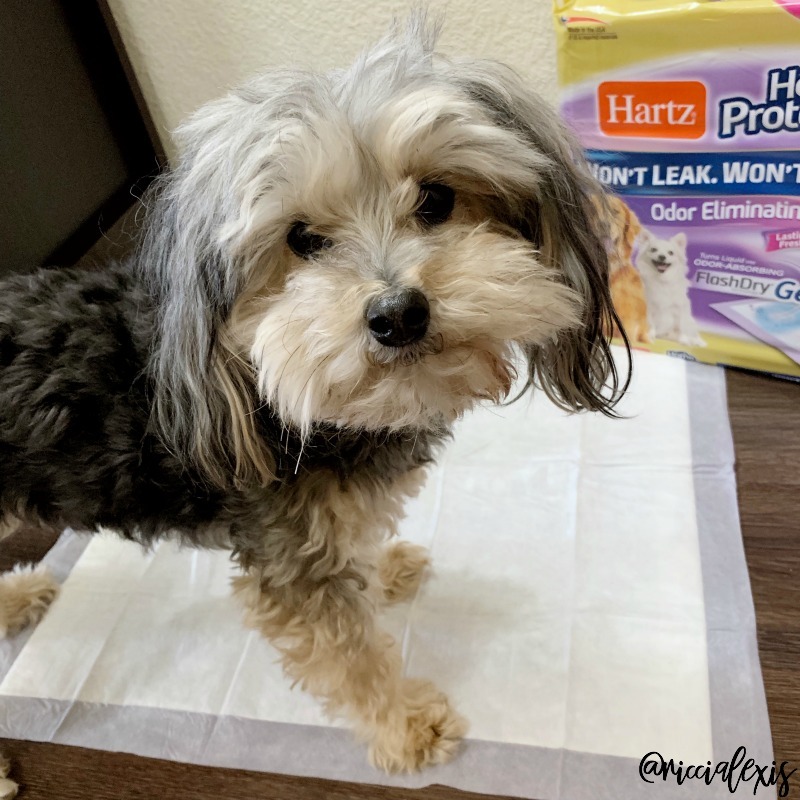 Transitioning Your Pet from a Home to an Apartment with the Help of Hartz Dog Pads! 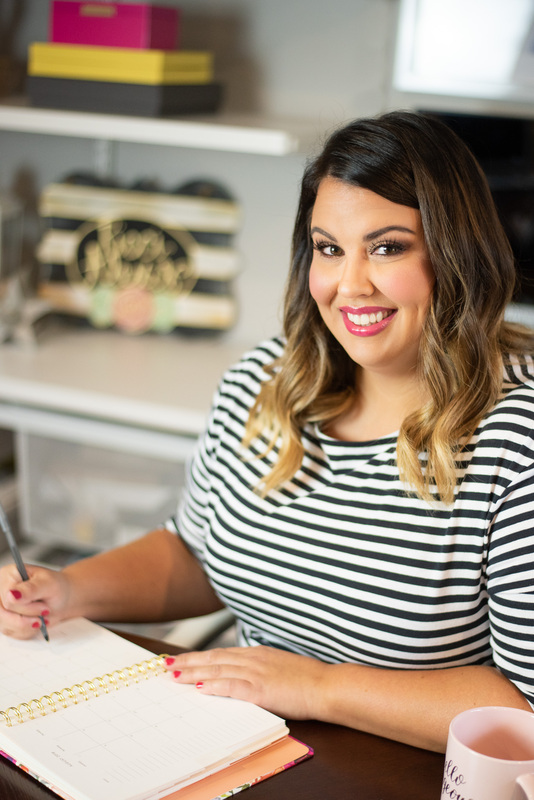 As you may remember (because I’ve mentioned it a million times on here…LOL) I sold my house and moved into an apartment this past summer. One question I get a lot about the move and apartment living is how Sophie is handling the move. 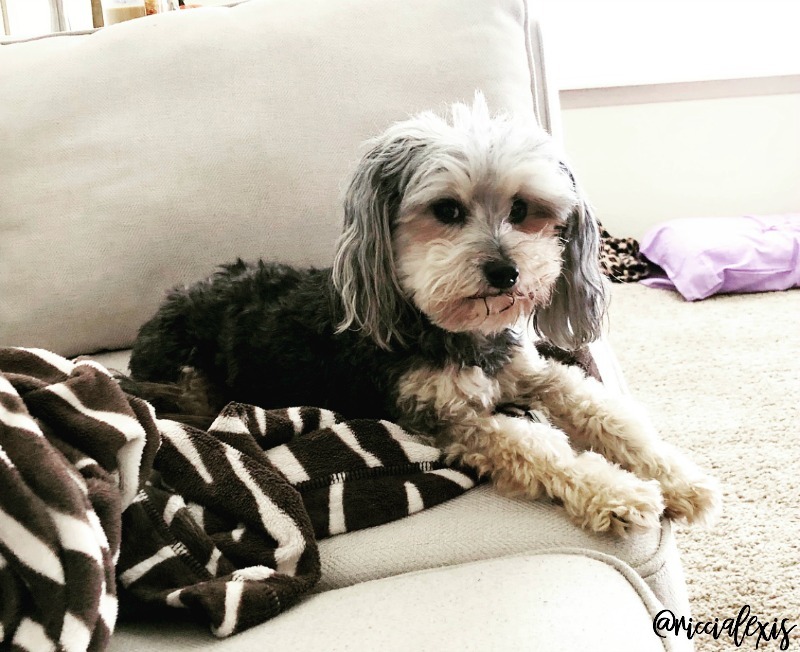 Here’s a little back story on my Sophie pup…I got Sophie about a month after I moved into my house so that is the only home she had ever known. She had always had a big back yard to run and play in and she loved it! She loves going to the park for walks but that had never been her primary means of “going outside”. As much as she loves the park and going for walks she really misses her back yard. One thing she has been super stubborn about is using her puppy pads in the apartment. Our house had all hardwood and tile floors and so that’s what she was used to. This apartment has a LOT of carpet and that’s way too tempting for my little alpha female. She likes to mark her territory and that’s no good!! It took a little bit to break her of wanting to pee on the carpet and that resulted in a LOT of puppy pads scattered all over! HA! She’s not new to using puppy pads, she used them at the house when I was at work but when I was home she was used to running free in the backyard whenever she pleased and it wasn’t a big production like it is now with having to put her leash on, walking down ALL of the stairs, and only staying outside long enough for her to do her business. Thankfully she has adapted to using puppy pads a lot more now that she has gotten used to apartment life. And as per her usual stubborn self she has gotten picky as to what pads she uses. Before I just grabbed whatever was cheapest, was on sale, etc. But now she’s gotten picky and that’s ok because I recently discovered a puppy pad that both she and I love and as a bonus they smell really good too! HA! 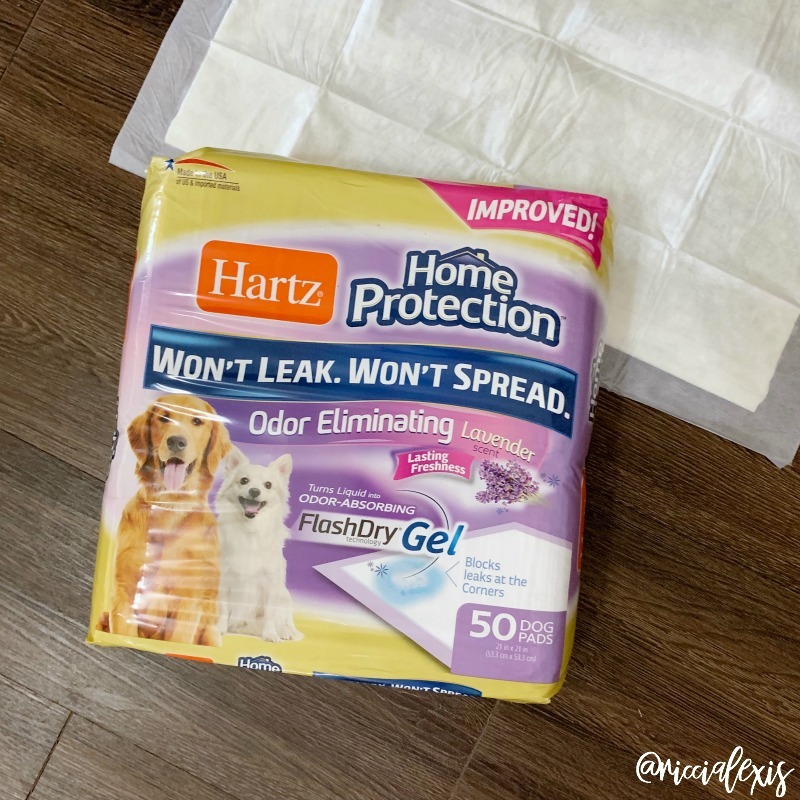 These Hartz Home Protection Dog Pads contain the FlashDry® Gel technology that locks in moisture and allows for multiple uses plus they contain a fresh lavender scent for lasting freshness. And if you know me you know I am not normally a fan of lavender scented things but these puppy pads smell AMAZING. And y’all know how I feel about home scent and for me to say that a puppy pad smells good, I mean it! 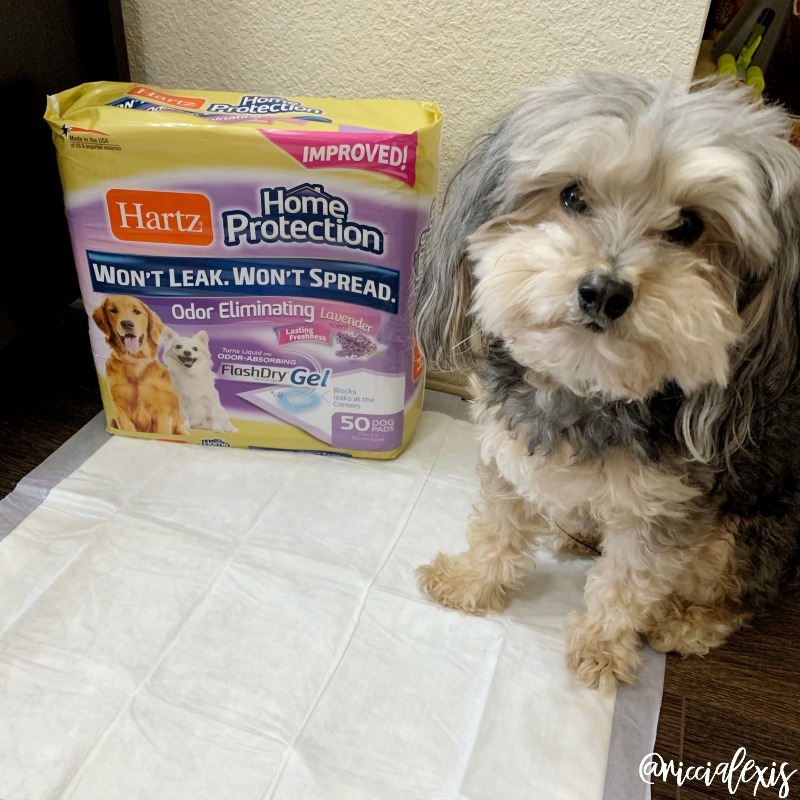 You can find these Hartz Dog Pads at your local Walmart or on Amazon (hello Amazon Prime!) and Hartz Dog Pads are America’s #1 brand of dog pads and I fully believe that. Remember, I’ve literally tried them all so you don’t have to! HA! So I am proud to say that after some initial hesitation my Sophie girl has finally decided that we do indeed live in the apartment and I think she even kind of likes it now! What I do know it that she definitely loves her new Hartz Dog Pads! Have you ever transitioned your dog from a home to an apartment?? Awww, she is such a sweet looking dog! We have 3 dogs and it’s amazing how adaptable they can be! These do sound like great pads for dogs! We only have cats, but one of them needs some of these. Sometimes she likes to poop on the floor, and I’m over that. She is really sweet, Now I don’t have any dog, May we are planning to get one during this summer. This dog training pads will be great help at that time. She looks like she’s such a sweet dog. These training pads worked really well when we were training our puppy. There definitely what to get when you’re training your dog. In our home we have multiple dogs and one of them is older. So we use these pads all the time and I would be lost without them. Your fur baby is so adorable. When we did have a dog, it was a pretty hard transition. The pads really come in handy. I can imagine these are a life saver and definitely do wonders for keeping messes contained and easy to clean up. Thanks for sharing this! Moving is never easy, but helping a pet get adjusted to new surroundings makes the process even more difficult. I’m glad you found a proper potty solution for your sweet girl. I never would have thought of that as an issue. Great idea! It might be helpful during hurricanes (we made a litter box in the garage for our dog) or when traveling with your dog. We used these pads when potty training our senior dog that we got from a shelter. He hated going outside when it was cold to use the potty. We are very fortunate to have a great back yard for our puppy. She can run around and go potty whenever she needs to. What a cutie! glad she is adjusting to the big changes. Your pup is absolutely adorable. She does have an impish look in her eye! My dogs transitioned mostly ok, but one of mine had difficulties and the other sailed right through it. This is an awesome ideas. Sometimes, there are situations when we really need a dog pad for our little dog. Thanks for sharing it! Sophie is such a cutie! You make me want to get a pup asap. I bet the change was hard on her and Hartz made the process a lot easier. These dog pads are a great thing to have for pet owners moving to an apartment. I know someone making a move like this with a pet. I’ll share this with them.